We’ve had the worst year ever on our plot. Lack of time combined with mega numbers of pests including deer, has meant little survived. We do, however, have plenty of kale. When I found a big bag of kale in my veg box last week, I knew I had to up my game. 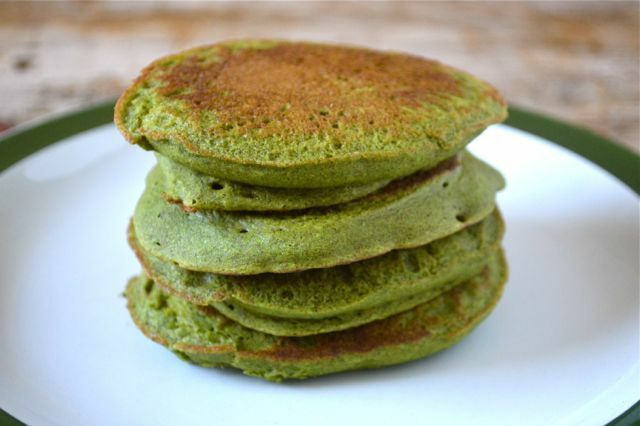 The result was a big batch of these vibrant green kefir kale pancakes. Served with vegetable tomato sauce and fried halloumi, it made for a most delicious meal – several meals in fact. When I make pancakes, I tend to churn out quite a few. Why make one meal when you can have two or more with very little extra effort? Pancakes keep well for a couple of days once cooked and can be frozen for longer storage. They can easily be reheated in the oven or popped into a toaster. Kefir is a great ingredient to use in pancakes. It gives a lovely fluffy texture and reacts with the bicarbonate of soda to give a good rise. Once you start making your own kefir, there is plenty to go around. If you don’t have kefir, sour milk or buttermilk work well too. I made these kefir kale pancakes with buckwheat flour and rolled oats. This gives a nice flavour and makes them naturally gluten free. If you’d like to see what other pancake recipes I have on the blog, just click the link. I used my new Optimum G2.3 platinum series induction blender to blitz the kale and oats into the kefir. I then added the remaining ingredients and whizzed again, which made for a fast and easy way of making kefir kale pancakes. Kale is packed full of nutrients: dietary fiber, calcium, potassium, vitamin E, vitamins C and B6, iron and magnesium to name but a few. It’s also easy to grow in the UK and is at it’s best in the autumn. We’ve grown several different types of kale over the years, but this year we only managed our perennial land kale. I saw some lovely varieties on a friend’s plot at the weekend, which has spurred me on to try something else next year. Adding kale to pancakes is also a fun way of getting some extra veg into fussy kids. As well as kale, I also added some turmeric and black pepper to the mix. I’m trying to get a daily dose of turmeric to ease joint pain in my knees. It seems to be working. Apparently black pepper helps turmeric to do it’s thing, so I added some of that too. Cinnamon is also a recommended addition, but rather than add this to the pancakes, I thought it would go better in the accompanying tomato sauce. For the spicy tomato sauce, I fried an onion and garlic in olive oil then added some veg that needed clearing out: courgettes, mangetout and baby corn. I threw in a can of tomatoes along with a little harissa, cinnamon and tamari. The sauce was exceptionally good and married brilliantly with my kefir kale pancakes. A few slices of fried halloumi completed the meal. Alternatively you could try this recipe for tomato sauce, which is packed with hidden veg and is pretty tasty too. What a totally delicious meal for Meat Free Mondays with Jac at Tinned Tomatoes. As CT has been away, these kefir kale pancakes lasted me four days, so I’m also sending them off to Corina at Searching for Spice for Cook Once Eat Twice. Thanks for visiting Tin and Thyme. 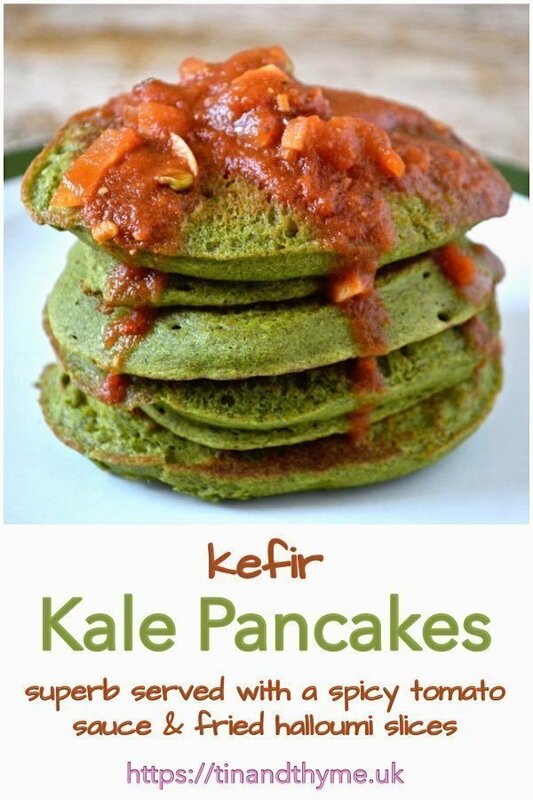 If you make these savoury kefir kale pancakes, I’d love to hear about it in the comments below or via social media. Do share photos on your preferred social media site and use the hashtag #tinandthyme, so I can spot them. For more delicious and nutritious recipes, follow me on Twitter, Facebook, Instagram or Pinterest. Kefir Kale Pancakes. PIN IT. 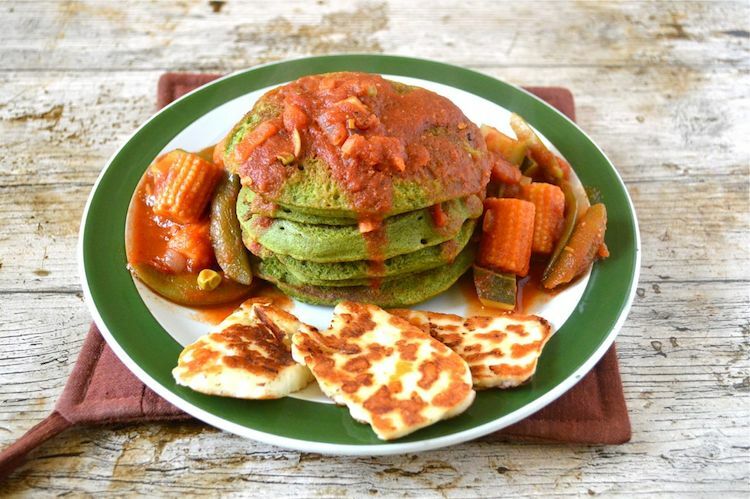 Vibrant green pancakes packed full of nutrition that are naturally gluten free. They go wonderfully well with a spicy tomato sauce and fried or grilled halloumi slices. Blitz the kale, oats and salt with the kefir in a power blender until you have a smoothish and bright green batter. I used my Optimum G2.3 for 90 seconds. Add all the other ingredients except for the coconut oil and blitz for a further 20 seconds or until everything is well mixed. Place a non-stick frying pan on a medium heat and add a little of the coconut oil. Pour dollops of batter into the pan, making sure there is room for them to spread. How many you get in will depend on how big the pan is. Cook for about 3 minutes or until bubbles start to rise up in the batter, then flip over and fry for a further 3 minutes. Stack on a plate and put in a warm oven until all of the pancakes are cooked. If you need the pancakes to be gluten free, ensure the oats and baking powder are gluten free. If the batter is a little too runny, leave it to stand for half and hour and it should firm up. Each batch of pancakes will take about 6 minutes to cook. The total cook time will depend on how big your pan is and how many pancakes you can fit into it. Pancakes can be frozen and reheated in a toaster or a warm oven. I use my Optimum Blenders for smoothies, spreads, sauces and even chocolate making. The post contains affiliate links. Buying through a link will not cost you any more, but I will get a small commission. Thanks to my readers for supporting the brands and organisations that help to keep Tin and Thyme blithe and blogging. Opinions are, as always, my own. These sound delicious, what I great way to use up some kale – I’d have never thought of that! Thanks Caroline. If it wasn’t for my super duper blender, I’d probably never have thought of it either. Oh my goodness, these look amazing and THEN you add haloumi into the mix! So much temptation, I am indeed green with envy! Yes, I think it’s the sort of thing kids would find so weird they’d eat it, but you never know. They look great! 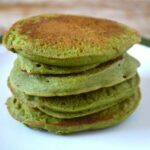 We love green pancakes here – my kids aren’t phased by them at all. I love the sauce you’ve added and it’s a lovely nourishing meal. But your kids are possibly not the norm Kate, they are used to green cake! It’s a fab colour and the pancakes tasted great. I actually had them 4 days on the trot and didn’t get bored at all. These pancakes have colour and oomf from the puffy aspect which I really like. I love kale its my favourite leafy green to eat, I am sorry I did not grown any this year, but like you the pests have been horrid this year, that I delib. cut down on the brassica family. Thank you for sharing with EatYourGreens, the round up will be up on the 1st December. Thanks Shaheen. Kale is brilliant because it’s generally easy to grow as well as nice to eat. I’m just crossing fingers we have a better growing year next year. Your pancakes look lovely by the way. My family loves spinach pancakes but I’ve never made them with kale before. Will definitely have to give it a try. They are such a glorious green! I must admit that I rarely think to use kale as an ingredient, probably because K and I both love it as a standalone veg (and we don’t have kids!) but I could be tempted to make these, just for the colour alone! I love these pancakes…healthy natural ingredients and the pancakes turned out so fluffy and awesome. A great recipe, Choclette. Thanks Sarah. I’ve used various green powders in the past, but this was the first time I used real fresh kale and I was so very pleased with the result. I’ll be making them again and again from now on. I feel your pain re the kale. The wretched pigeons keep attacking ours, but at least we’ve managed to get some. Most of our crops this year were eaten by one pest or another, so we’ve had to stick to a veg box. These looks beautiful and I love the way they are served with the halloumi and vegetable tomato sauce. I have to admit that it’s a long time since I’ve bought kale as I seem to be the only one in our family who likes it so maybe I should try hiding it in a pancake. Thanks so much for sharing with #CookOnceEatTwice! Thanks Corina, it made a pretty scrummy meal – several in fact 😉 Yes, try hiding the kale in pancakes, I’d be very surprised if your family didn’t like them. These are gorgeous! I love kale in anything. Kale used to be a much underrated green veg, so glad it’s profile has been raised in recent years. I much prefer savoury pancakes to sweet and what a brilliant way to use up kale! Thanks Cathy. I’m with you when it comes to pancakes.